When it comes to unfair fights there's mismatched and then there's this fight that took place for Rizin’s New Year’s Eve 2016 show in Japan. 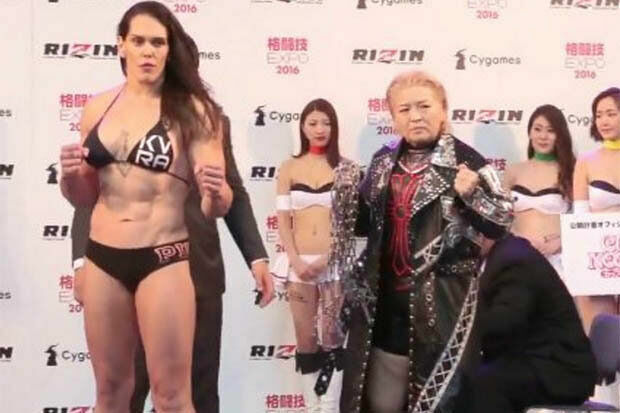 It saw Gabi Garcia, a towering 6ft 1in Brazilian MMA fighter take on the 49-year-old Yumiko Hotta. Hotta, along with being shorter at 5ft 6in, is also 100lb lighter. Jiu-Jitsu star Garcia is 245lb and has a 3-0 record in her MMA fights, while 49 year-old politician and pro wrestler Hotta weighed in at just 159lb. Hotta, as well as being a former professional wrestler in Japan in the 90's and quite a big star in her day, also fought in MMA off and on throughout her career. But she hadn't fought properly since 2000, although she had a gimmick fight in 2012 which, strangely, was against George Lucas' daughter Amanda Lucas. It's no surprise that many MMA fans were astonished and thought the idea of the two fighting was somewhat irresponsible and a little crass. It also didn't help that Garcia's past Jiu Jitsu credits included 9x World Champion black belt, 6x Panamerican champion, 8x world champion and Pro 2x adcc champion. The MMA Fighting website reiterated how mismatched they were by letting people know that, "Only two of Hotta's wins [in her career] were against non-pro wrestlers and all four losses were via submission against fighters with nowhere near the Jiu Jitsu credentials of Garcia, who has won 11 world championships in that sport." So fans were concerned that Garcia might cause some serious damage to Hotta, even kill her. But the fight went ahead and, fortunately, Hotta wasn't hurt too bad. When the bell started in the first round Hotta tried to make the bout fun for as long as she could manage but in the end she was no match for the sheer size and skill of Gabi Garcia. But she did take a pounding and it's tough to watch, especially when she takes a knee to the face. Jesus, what were they thinking? It's probably the easiest win Garcia is ever going to have. For more mismatched MMA fights, although none quite as absurd as this, check out the compilation below. But always remember the original 'David & Golliath' story where things can go the other way such was the case when 600lb Emanuel Yarbrough fought 169lb Daiju Takase in 1998 at the Nippon Budokan in Tokyo, Japan. It just goes to show that 'sometimes' the little guy wins. But not always.